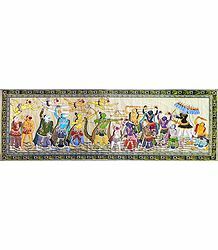 Indian mythology often brings us tales of several wise men and women, many of who were able rulers and administrators. These men and women rose to the helm of their lives and careers, creating an indelible mark in the history and culture of the land. They, however, had just one small failing, which eventually emerged as the root cause for their fall from the heights of success to the depths of despair and, finally, decay. Such is the story of the mighty Ravana; the legendary ruler of Lanka. The Ramayana does not speak much about this powerful demon King, who verily changed the course of the epic itself. While Ravana was born a rakshasa (asura or demon), he emerged as a genius - a scholar of repute; a great musician, especially known for his prowess on the Ravanahatha (a variety of the Veena); and one who successfully ruled over all the three worlds. The life story of Ravana is truly inspiring. A devout follower of Lord Shiva, he was one of the most powerful beings and rulers of all time. He was known for his wisdom, strength and control over the gods, demons and human beings alike. He is believed to have ruled over the city of Lanka for several hundred years, prior to the emergence of the Ramayana. Yet, the Valmiki Ramayana portrays the demon King in a rather negative light; as a powerful tyrant, who committed evil deeds and, many a time, held the gods at ransom. In the classic version of the epic, he is despised for kidnapping Sita, Rama's wife. This he did, in order to claim vengeance on Rama and his brother Lakshmana, for them having cut off his sister, Shoorpanakha's nose. Let us now delve deep into the story of Ravana and know more about this powerful ruler's life and times. Ravana was born to a great sage, named Vishrava (also Vishravas or Vesamuni) and his wife, Kaikesi, who was a daitya (demon) princess. Even today, the residents of the Bisrakh village in Uttar Pradesh claim that their village was named after Vishravas and that Ravana was actually born there. The word "Ravana” means "roaring”. It is the opposite of Vaisravana, which means "to hear clearly”. Both Ravana and Vaisravana (more popularly known as Kubera, the Treasurer of the Devas) are the sons of Vishravas. 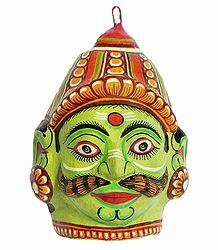 Besides this name, Ravana is also addressed by other names such as Dasaanana, Ravula, Lankeshwara, Lankeshwaran, Dasis Ravana, Dasis Sakvithi Maha Ravana, Ravaneshwaran and Eela Vendhar. Ravana is often portrayed with ten heads. These heads are symbolic of his vast knowledge - they represent his mastery over the four Vedas and the six Shastras. He was extremely wise, powerful and ambitious as well - his major goal was to dominate the devas (gods) and gain full control over the entire Universe. He is believed to have been in possession of the Nectar of Immortality, which he carefully stored within his belly. This was a boon that he had received from Lord Brahma, the Creator of the Universe. According to this boon, he could he vanquished only and only if someone managed to pierce through his belly and destroy the nectar lying within. Ravana prominently features in the Buddhist text, the Lankavatara Sutra and some other texts of the Nyingma School of Tibetan Buddhism as well. 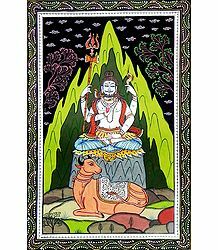 Ravana is believed to be the author of the Ravana Samhita (a book on Hindu astrology), the Arka Prakasham (a book on Siddha medicine and treatment) and seven other books on Ayurveda. Besides, he also wielded completely mastery over Siddha and political science. 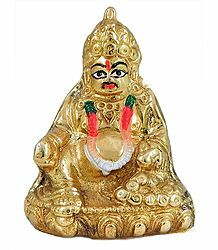 Moreover, he is worshipped by Hindus in some parts of India, Sri Lanka and Bali. Since he was one of the greatest devotees of Lord Shiva, he is sometimes associated with Shiva in some places. In some Javanese legends, Ravana is portrayed having only nine heads. That is because he is believed to have sacrificed one head to display the extent of his devotion toward Lord Shiva. In some legends of Java, it is believed that Ravana cuts off one of his heads every year and presents it to Shiva. Each of his heads represents one type of desire. By cutting one of them and offering the same to Shiva, he is believed to surrender one of his desires at the feet of the Lord Mahadeva. Ravana kept doing this every year, until only one head remained. This was his true head. Considering this and being pleased with Ravana's devotion, Shiva finally conceded that he was one of his greatest ever devotees and showered his grace on the demon king. In the Thai text, Ramakien, Ravana features as a Yaksa or rakshasa. His other names in this text include Rapanasur (the Asura Ravana), Totsapak (One with Ten Faces) and Totsakan (One with Ten Necks). 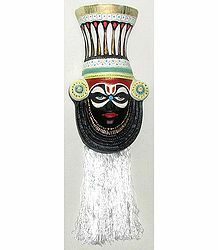 Ravana is referred to as Yawana or Datha-giri in their unofficial national epic, Yama Zatdaw. In Jainism, the incidents narrated in the epic Ramayana are believed to have occurred during the time of the 20th Tirthankara Munisuvrata. According to this version, Rama and Ravana were both devout Jains. Ravana was a Vidyadhara King, who wielded several magical powers. Here, as against popular belief, Ravana was killed by Lakshmana and not by Rama. Ravana, though a Rakshasa, was one of the most devout followers of Lord Shiva. He was also a favorite bhakta (devotee) of Shiva and had received several boons from the Lord Himself. Ravana, however, was also highly egoistic and hence, harbored a secret desire to subdue Shiva. Knowing that this negative streak existed in him, Mahadeva decided to teach him a lesson. One day, Ravana decided to go to Shiva's abode, Mount Kailash. The story goes that Ravana, on the orders of his mother, went to Kailash to bring the mountain to Sri Lanka. He was unable to cross the mountain with his pushpaka vimana. Shiva's vehicle, Nandi the Bull, warned him that he was restricted entry into the region, as Shiva and his consort, Parvati, were enjoying their time together there. Angered by Nandi's attitude, he mocked the bull and decided to take the mountain by force. He placed his arms and 10 heads under the mountain and proceeded to lift it. Shiva and Parvati started feeling the tremors and decided to investigate the cause of the shaking. Incensed by Ravana's arrogance, Shiva put his toe down on the ground. This pressure caused the mountain to come down on Ravana, trapping him beneath it. Only then did Ravana sense the real danger. He started screaming for help and begged Shiva's forgiveness. Fully understanding the Supreme power of Shiva, Ravana decided that he had to appease him somehow, if he wanted to survive. He immediately started chanting and singing the praises of his Lord. He cut off one of his heads to make a Veena (musical instrument) out of it. He then tore out his chest with his own hands; pulled out his tendons and intestines; made strings out of them; and, connecting it to his head, used the musical instrument to accompany his melodious singing. Losing himself in the melody, Shiva, for a moment relented and released his toe from the ground. In that instant, Ravana scrambled out from under the mountain. Realizing his great folly, he fell at the Lord's feet and shed tears of remorse and repentance. Pleased with his bhakta's transformation, Shiva blessed him and asked him to head back to Lanka. An ancient instrument, Ravanahatha, is said to have evolved from this story of Ravana playing the Veena. Legend has it that Hanuman picked up this instrument and brought it back to North India, after the end of the Rama-Ravana war. Incidentally, this instrument is still played in Rajasthan, India. It is also quite popular in the Middle East and parts of Europe, where it is known as the Ravanastron. According to the Ramayana, Ravana, though an Asura (demon), was born into the Devagana category. His grandfather, sage Pulastya, was one of the ten Prajapatis or the Manasaputras (mind-born sons) of Brahma - this technically makes him the great-grandson of Lord Brahma himself. Sage Pulastya was also one of the Saptarishis or the Seven Great Sages. Ravana thus came from a very illustrious family. His siblings included Vibhishana, Kumbakarn and Ahiravana and Kubera was his step-brother. Kubera had originally ruled Lanka. But Ravana eventually usurped the kingdom and ruled over the idyllic, beautiful city for many centuries. Lanka had been built by Vishwakarma, the Celestial Architect. Ravana demanded the city from Kubera, threatening to take it by force. Kubera discussed the matter with Vishravas, who urged him to give in to his half-brother's demands. Thus, Kubera gave away Lanka to Ravana and went off to the Himalayas. Though Ravana seized Lanka, he was a good and benevolent administrator. His ruled wisely and made sure to keep his subjects happy at all times. Lanka flourished during his rule. Eventually, Ravana proceeded to wage war against and conquer human, deva and asura kingdoms. The Ramayana states that Ravana was killed by Lord Rama when the latter waged a war to avenge the demon's act of kidnapping his wife, Sita. Ravana's downfall started with a series of events, right from the time of Sita's Swayamvara (marriage ceremony). The moment he set his eyes on the beautiful and radiant damsel that was Sita, he could think of nothing else. His wife, Mandodari, was a very beautiful woman. Besides her, he had an entire harem of the world's most attractive women. Yet, he wanted to make Sita his own. 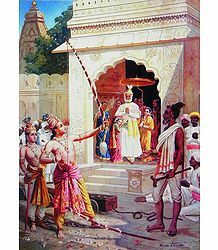 Sita's father, Janaka, who was the king of Mithila, organized a grand swayamvara ceremony for his daughter. He invited kings and princes from far and wide to participate in the ceremony. He placed a mighty bow inside one of the mandaps and announced that he would give away his daughter in marriage only to the one who would be able to lift this bow and string it. This bow was not ordinary - it was blessed by Lord Shiva himself. Hence, only someone truly special would be able to fulfill Janaka's condition. Several of those present tried lifting the bow, but failed. It was then Ravana's turn. The egoistic demon king was confident that he would be able to lift it effortlessly. He casually sauntered toward it and told everyone present that he would be able to lift it with his left hand. However, he was in for disappointment - the bow refused to budge. He then tried to lift it with both hands and again failed. This continued in spite of several attempts. He finally had to accept defeat and walk back to his place in the audience. Rama and Lakshmana were also invited to the ceremony. Rama walked up to the bow, saluted it and then lifted the bow in one easy, fluid movement. He then strung it with a thunderous twang, after which the bow broke into two. Sita walked up to Rama and garlanded him with the Varmala. Their wedding was celebrated with great pomp and show. In the meantime, Ravana, who was already bitter about losing the competition, was also enraged that she wedded Rama. He swore to himself that he would someday make her his own. Soorpanakha (literally meaning, "the one with the long nails”), is another very important negative character in the Valmiki Ramayana. The sister of Ravana, she also features in Indonesia as Sarpakamaka, in Khmer as Surpanakhar, in Malaysia as Surapandaki and in Thailand as Sammanakkha. 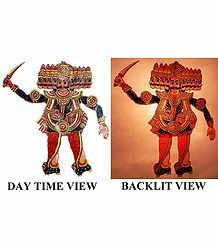 In the Ramayana, she is described as being a viroopi (ugly, with contorted features) - pot-bellied, cross-eyed, with a grating voice and thinning hair. 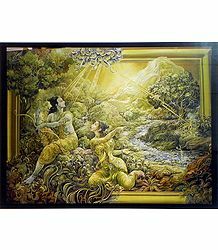 She saw Rama while he was roaming in the forests of Panchavati, during his vanavaasa (exile). She was instantly smitten by his looks and physique and proceeded to make advances on him. She approached him and expressed her desire to marry him. Rama refused, saying that he was already married to Sita and had also taken an ekapatni vrata (the vow to wed only once). He asked her to go to Lakshmana instead. Though unwilling, she approached Lakshmana and asked him if he would marry her. He too reacted in a similar fashion and said that he would never be able to see her as a wife. Soorpanakha kept beseeching both brothers and they kept refusing her advances and also made fun of her. Enraged and humiliated, she proceeded to attack Sita. However, she was stopped by Lakshmana, who cut off her nose and ordered her to go back to Lanka. Soorpanakha first went to her brother, Khara and told him about the incident. He, along with an entire army, tried to attack the princes. However, they were routed at the hands of Rama and Lakshamana. She then went to Ravana, asking him to avenge her plight. Angered to see his favorite sister suffering thus, Ravana decided that he would abduct Sita to make Rama and Lakshmana realize their folly. Ravana asked his uncle, Mareecha, to assume the form of a golden deer and walk up to where Rama and Sita were living, so as to entice her. Mareecha did as he was told - he took the form of a beautiful and radiant golden deer. Sita was immediately attracted to the animal and requested Rama to pursue it and bring it to her. Though he had misgivings about this, Rama decided to fulfill his wife's desire. As he pursued the deer, it ran farther and farther into the forest. 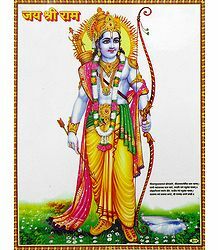 When Rama finally caught up with it and shot an arrow at it, the golden deer called out to Lakshmana, asking for help, in Rama's voice. Mareecha then took his original form, before succumbing to his injury. Shocked to hear her husband's voice, Sita ordered Lakshmana to go in search of her husband. The latter was unwilling to leave her alone there. However, when Sita insisted that he go help his brother, he requested her to stay indoors and not come out. Lakshmana then took an arrow, said a mantra and drew a protective line in the sand, all the way around the house. 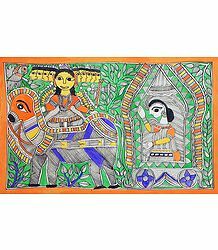 He assured her that she would be completely safe as long as she stayed inside this Lakshmana Rekha (line drawn by Lakshmana). He then proceeded in search of his brother, Rama. As soon as Lakshmana departed, Ravana, in the guise of an old Brahmin sadhu, came to the hermitage, begging for alms. Sita was in a dilemma - she could never refuse alms and yet, she was ordered to stay within the Lakshmana Rekha. She asked him to come to her and take the alms, but he adamantly refused; asking her to come to him instead. He was well aware that he would not be able to cross the line and so, he decided to lure Sita out of it. Eventually, Sita gave in and, crossing the Lakshmana Rekha, offered the food to him. Ravana immediately took his original form and, scooping the entire chunk of earth that Sita was standing on, carried her away in his pushpaka vimana and proceeded to Lanka. Once there, he brought her to Ashok Vatika, a beautiful garden with idyllic surroundings. There, he held her hostage, guarded by several Rakshasis. Though he desired Sita, he decided not to take her by force. Instead, he intended to keep her captive till the time that she changed her mind and was willing to marry him. There is yet another interesting angle to this story. Vedavati, a pious Brahmin woman, was actually a human avatara of Goddess Sri Maha Lakshmi. In her human manifestation, she always wanted to marry Vishnu. One day, when she was meditating at the riverbank, Ravana happened to see her and was instantly smitten by her radiant beauty. He approached her and tried to violate her. Wanting to escape from him, Vedavati jumped into a fire pit that had originally been created for a yagna. Before dying, she cursed him that she would be responsible for his death in her next birth. Sure enough, in her next birth, she was born as the daughter of Mandodari and Ravana. Remembering the curse, Ravana threw the child into the sea. She fell on the lap of Goddess Varuni, who then took care of her, before handing her over to Bhoomi Devi (Mother Earth). Bhoomi Devi then kept her hidden in a casket beneath the earth and King Janaka found her while ploughing the field. Though the Valmiki Ramayana makes no mention of Sita being Mandodari's daughter, some other versions of the epic narrate how Sita, born as Mandodari's daughter, becomes the cause of Ravana's destruction and death. According to the Adbhuta Ramayana, Ravana used to store the blood of the sages that he killed, in a pot. Elsewhere, sage Gritsamada was in penance to beget Goddess Lakshmi as his daughter. He stored milk from the Durbha grass in a pot and purified it with mantras, hoping that Lakshmi would inhabit it. Seeing all this, Ravana poured this milk into his pot of blood. In the meantime, Mandodari, who was already frustrated living with the evil Ravana, decided to commit suicide. She drank from the pot of blood, hoping that it would kill her. 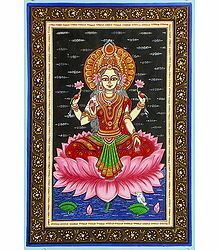 However, instead of dying, she became pregnant with the incarnation of Lakshmi. Horrified, Mandodari buried the foetus in Kurukshetra, where King Janaka discovered her later. There are several more adaptations of the original epic, which mention Sita as Ravana's and Mandodari's daughter. In all these versions, Sita is described as Sri Lakshmi's avatara, who came down to Earth with the mission of destroying the demon King. Rama decided that he would fight Ravana like a warrior, defeat him in battle and then return to Ayodhya with Sita. The Yuddha Kanda, also known as the Lanka Kanda, describes in detail the war between the armies of Rama and Ravana. Rama's Vanarasena helped him build a bridge to Lanka, using which they crossed over to the borders to that country. A lengthy war ensued. Ravana's son, Indrajeet, hurled a powerful astra (weapon) at Lakshmana, which seriously injured the latter. Hanuman then rushed to Mount Sumeru on the Himalayas, to find the Sanjeevani herb, which would bring him back to life. 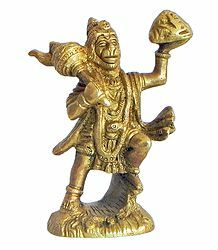 Not wanting to waste time searching for the particular herb, Hanuman lifted the Sumeru and brought it to Lanka. The herb brought a dying Lakshmana back to life and the brothers resumed fighting Ravana's army. The war claimed many a life and created much damage on both sides. The mighty Indrajeet was also killed in the war. Finally, Rama and Ravana came face to face. Rama kept hurling arrow after arrow at the Rakshasa, to no avail. They merely brushed past the demon, causing no damage whatsoever. Rama grew increasingly anxious. The Gods too, who were watching from heaven, started growing tense, wondering how to curb the ten-headed Ravana. The Devas approached Indra, who thought a while. He then sent his celestial chariot, driven by Matali - he was sure that his charioteer would help Rama. Rama jumped into the chariot and started firing more astras at Ravana. Matali instructed Rama to use the all-powerful Brahmastra - the ultimate weapon, which would definitely destroy the Ruler of Lanka. He also reminded Rama that Ravana had to be struck below the navel, in the location of the Amrit - only then would he be able to kill Ravana. Rama invoked the Brahmastra, chanted the name of Parvati, Shiva's consort, and aimed the astra at Ravana's navel. The potent weapon pierced Ravana's body, making him stumble and fall to his death. 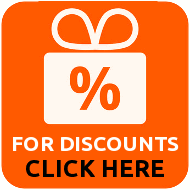 This signaled the end of the war between Rama and Ravana. Dying at the hands of Lord Rama automatically bestowed Moksha (liberation) upon Ravana. Hence, he immediately ascended to heaven. He was, after all, a great scholar and a wise and pious person. Though he had committed certain sins, it was only because it was his Asura guna that showed up at that time. Also, he had died fighting valiantly on the battlefield. Hence, Ravana was given a befitting funeral, receiving all the respect a true warrior should. The Gods rejoiced Ravana's death and showered flowers from the heavens. Rama approached Vibhishana and thanked him for all his help both before and during the war. He then announced Vibhishana as the King of Lanka; released Sita from captivity and proceeded back to Ayodhya along with her, his brother, Hanuman and the rest of his army. The Ramayana portrays Ravana in a negative light; as the main antagonist in the epic. However, the fact remains that he was a great man, worthy of the highest respect any living could get. Here are certain interesting, lesser-known facts about the mighty Demon King of Lanka. The demon king was so powerful that, with a mere thought, he could control sunrise and sunset. During the birth of his son, Meghnad, he instructed the planets to line up in an auspicious manner, so that he could be granted the gift of immortality. All the planets agreed to his order, except Shani (Saturn), who moved to the 12th house. This is regarded as inauspicious. It angered Ravana so much, that he is believed to have imprisoned Shani Deva for his impudence. Ravana got his name, much later in life, from Lord Shiva himself. When the latter tried to crush him under Mount Kailas, Ravana tore open his own body, made a Veena out of it and sang the Shiva Tandava Stotram (a hymn in praise of the Cosmic Dance of Shiva). Shiva was so enamored by the Asura's genius, that he named him Ravana (the one who roars out loud). Before starting the construction of the Rama Setu, Rama was searching for a pundit to help him with the pooja ceremony. Since Ravana was the most learned and qualified pundit in the vicinity, he helped out Rama at the latter's behest. Ravana suggested the most auspicious time to commence the battle and even blessed him saying "vijayi bhava” (may you be victorious). Rama praised the daitya king as a Mahabrahmin and so, he had to perform the Ashwamedha Yagna to defeat Ravana. Ravana was once defeated and imprisoned by Bali. One day, when Bali was worshipping Surya Deva (the Sun God) in the morning, Ravana, filled with pride at getting a varadana (boon) from Shiva, challenged Bali. The latter tolerated him for some time. When he finally lost patience, Bali grabbed Ravana, tucked his head under his armpit and kept him imprisoned there for 6 whole months! He released the demon king only after he had learnt his lesson. Ravana was weak towards women. Once, he made advances towards the wife of Nalakubera (son of Kubera). The latter cursed him that he would not be able to touch any woman without her permission to do so. That is why Ravana could not touch Sita when he abducted her - he had to lift the entire chunk of earth that she was standing on. Ravana had several wives, out of which Mandodari was his favorite. She was also his Patrani (chief consort). Very beautiful and wise too, she is one of the five sreshtha naaris or panchakanyas (the most exemplary wives). When Ravana realized that Rama and his vanarasena (army of monkeys) had routed his army and that he was the only one alive, he decided to conduct a yagna to turn the tide. This yagna required him to stay put in front of the homakunda (sacrificial fire) and not move from there till it was over. Knowing this, Bali's son, Angada, grabbed Mandodari and dragged her to him. Ravana saw this, but did not move from his place. 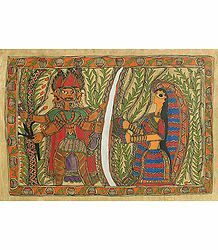 Furious at being humiliated thus, Mandodari screamed at him and shamed him, saying that while Rama was waging a war to get his wife back, he (Ravana) was doing nothing to protect her, his favorite wife. This riled Ravana enough to get up from the yagna to save her; thus leaving the ceremony incomplete. Being a wise man, an ace astrologer and an equally powerful Asura, Ravana was well aware about his impending doom at the hands of Rama. He knew that Rama was an avatar of Vishnu and had come down to Earth with the sole purpose of vanquishing him. He welcomed the idea of attaining moksha at the Lotus Feet of the Lord, and hence, played along with the elaborate cosmic drama. Ravana imparted valuable knowledge to Lakshmana, even as he lay dying on the battlefield. Rama asked the latter to sit beside the dying Asura and learn from his immense wisdom. In spite of being in terrible pain, the dying Ravana gave him advice on politics, statecraft and diplomacy. He related incidents and experiences from his own life and guided the younger warrior on aspects such as maintaining good relations with the charioteer, ministers, cooks, gatekeepers and so on. He also advised Lakshmana never to underestimate enemies; to trust his minister; and to delve deep into astrology as well. Such was the demon king's magnanimity. The great Asura king and his brother Kumbhakarna were actually incarnations of Jaya and Vijaya, the Dwarapaalas (Gatekeepers) of Lord Sri Maha Vishnu himself. They were born on Earth, as a result of a curse they got from the Four Kumaras (the mind-born sons of Brahma), for having insulted them. When Jaya and Vijaya realized their folly and begged for forgiveness, the sages said that they could either choose 7 lifetimes as human beings, being allies of Vishnu's avataras; or they could opt for 3 lifetimes as their enemies. The gatekeepers chose the latter, which is why they were born as Ravana and Kumbhakarna during one of those lifetimes. Ravana is worshipped in a temple in Kakinada, Andhra Pradesh. Here, one can find a huge Shivalinga, supposedly installed by the asura himself. The fishermen community here worships him, along with Shiva. There are temples dedicated to Ravana worship in Uttar Pradesh, Rajasthan and Madhya Pradesh. The Sachora Brahmins of Gujarat claim to be descendants of Ravana - some of them even have Ravan as their surname. Ravana is mainly worshipped in Sri Lanka. The Koneswaram temple in Trincomalee and the Kanniya Hot Water Spring are two main such sites in that country. Was Ravana Only a Legend? Some believe the Ramayana to be merely semi-fiction, based upon the life of a real king who had ruled over Sri Lanka from 2554 to 2517 BC. According to Sri Lankan legend, the city made much socio-economic and scientific advancement during his tenure. This ruler's kingdom was mostly concentrated around the Eastern and Southern corners of the country. Eventually, after many years, it is believed to have been lost to the sea. Many even insist that Ravana was a Buddhist king, who was mainly responsible for creating the several monasteries that can be found even today in Sri Lanka, such as Kuragala and Rahalgala. The entire nation is filled with locations such as SitaElisa and NumaraElisa - these are believed to be the places where Sita was held prisoner. Besides, regions such as the Wariyapola and Horton Plains are believed to have been the landing sites of his Pushpaka Vimana (flying machine of sorts). Rumassala, a mountain peak in the South of Sri Lanka, is considered to be a part of the Himalayan ranges. This mountain, filled with medicinal plants, is believed to have been brought to this place by Hanuman. The latter flew to the Himalayas to procure the Sanjivani plant to cure Lakshmana of his fatal wounds during the course of the war between Rama and Ravana. He is then believed to have left the mountain here after the war ended. This mountain, to date, contains a variety of medicinal plants and herbs. Adam's Bridge, a chain of limestone shoals, connects Rameshwaram Island (in the south eastern coast of Tamil Nadu) to Mannar Island (off the north western coast of Sri Lanka). This bridge, which is still in existence, is also connected to the legend of Ravana. Also known as the Rama-Sethu or Rama's bridge, it is believed to have been built by the latter's legendary Vanarasena (Army of Monkeys), thus enabling Rama to cross over to Lanka. Interestingly, investigations conducted by the Indian National Remote Sensing Agency indicated that this bridge was manmade and may have been constructed 3500-5000 years ago. Some Sri Lankan historians, however, disagree with this view. According to them, this bridge was built by Ravana and was a floating structure, which connected Sri Lanka to India. They further aver that the selfsame bridge was used later by Rama to cross over to Lankapura. Once Rama had entered the boundaries of Lanka, he teamed up with Vibhishana to overthrow one of the greatest ever rulers; eventually bringing down one of the most advanced civilizations known to history at that point in time. Irrespective of whether Ravana actually existed or not, the fact remains that the story of this demon King is both fascinating and awe-inspiring. An expert in the 64 arts; a musician and astrologer par excellence; a mighty Atimaharathi (warrior who could fight and vanquish several warriors at a time); a capable ruler and administrator; an unswerving devotee of Shiva; the one who got his name from Shiva himself - there are indeed so many things to admire about this great soul. Yes, his ego came in the way of his progress as a seeker. Yet, none of us is perfect - all of us have faults; major and minor. In spite of his failings, Ravana was fortunate enough to attain moksha at the hands of an avatar of Lord Sri Maha Vishnu himself. This point bears testimony to his true greatness and spiritual power.